Is there a 14 year old boy on your holiday gift-giving list this year? If you’ve ever shopped for a gift for a teenage boy, you’re painfully aware of how difficult this age group can be. It doesn’t help that by the time they reach the teenage years, adolescents have firmly established personalities – complete with firm likes and dislikes – that are highly individualized. Some 14 year old boys are gaming enthusiasts, while others enjoy sports or science. Do sick tricks, flips and rolls with one button. Take amazing HD aerial shots. Perfect gift for today’s teenage boy! While you need to know your gift recipient’s personality, you also need a source of great ideas. (Let’s face it: It’s been a while since most of us have been the ripe old age of 14.) Not to worry; we’ve compiled a list of 50 top-rated gifts that 14 year old boys are sure to love this holiday season. Whether you’re shopping for a gamer or a sports fanatic, you’ll find something on this list he’ll be ecstatic to receive. Our picks are listed below in alphabetical order for easy reference. Ratings information is based on Amazon reviews and is current at the time of publication. Teenagers have always appreciated the latest hits, and today’s 14 year old boys are no different. That’s why an Apple iPod Touch is the perfect gift for a boy at this age – plus, the iPod Touch is compatible with most apps from iTunes and the App Store. In fact, by downloading a texting app and an app to make calls, the iPod Touch can function almost exactly like a phone, and that means peace of mind for mom and dad without actually giving in and buying him his own phone. If you have a budding engineer on your holiday shopping list this year, consider this Arduino Starter Kit, featuring a 170-page book with supplies and instructions for creating 15 different projects, from a door requiring a secret code to enter to a musical instrument that you play by waving your hands. This light-up soccer disk glides over any surface easily, as it floats on a cushion of air. That alone is cool enough to impress even the most cynical teenage boy, and because it’s suitable for both indoor and outdoor play and won’t damage furniture, it’s a gift mom and dad will appreciate, too. A nighttime, outdoor activity designed for groups, Capture the Flag REDUX is a game your teen will love to enjoy with a group of his closest friends – no TVs, computers, or tablets required. Zombicide Black Plague is a board game that’s sure to impress the 14 year old boy who loves zombies and other gory stuff (as so many teen boys do). And because it’s designed for 1 to 6 players, he can play alone or with a small group of friends or family. Boys and girls alike love dodgeball, and your teen will be the talk of the neighborhood with this Coop Scatter Dodgeball Game. A fun, action-packed twist on the original, this game is suitable for ages 5 and up. Roger von Oech’s Ball of Whacks provides a stimulating and mentally challenging activity for people of all ages. A magnetic design block ball, it can be rearranged in countless ways, giving your teen an opportunity to flex his creative muscles and challenge his mind by recreating the configurations in the accompanying activity book. A ball with 12 holes and 11 colorful balls inside, the CuberSpeed Rainbow Ball is a challenging, fun activity that will occupy your always-bored teen for at least a few minutes, and it makes a great stocking stuffer. The goal is to get the balls back into their like-colored spots by fidgeting with the ball – which is easier said than done. Perfect for the 14 year old boy who loves spies and secret agents, Codenames is a social word game. Based on a simple premise, two teams compete to see who can connect with all their secret agents first – but teammates know their agents only by their codenames, and they must decipher clues to figure out who their agents are, while avoiding the assassin. Laser tag has been around for decades, but it’s so popular with people of all ages that it’s not going anywhere anytime soon. This multi-player 4-pack can be used for a 2-on-2 or an every-man-for-himself game, and because the blaster is the target, no vests are needed to participate in the action. For the 14 year old boy who loves science, this EcoSphere Closed Aquatic Ecosystem is sure to impress. A complete miniature world, it requires zero maintenance, so it’s a great gift for the teen boy who has trouble keeping up with tasks like cleaning the fish tank. Fire tablets provide an affordable option for younger teens who aren’t quite ready for a fancy, pricey iPad. The Fire HD 10 Tablet offers a 10.1″ 1080p Full HD display and up to 10 hours of battery life. The latest release in the Fire HD Tablet lineup, this tablet now has over 2 million pixels, stereo speakers, Dolby audio, and more. For the 14 year old boy who seemingly has everything, the Geospace WALKAROO XTREME Steel Balance Stilts might be just the gift for him this holiday season. They’re suitable for advanced stilt-walkers, ages 6 and up, and can support up to 210 pounds. Your teenage boy will love to listen to his favorite music, movies, and more with high-quality sound thanks to this speaker set that works with his computer, laptop, tablet, or even his iPod or smartphone. Plus, the LED lights that pulse to the beat of the music will create an atmosphere he and his friends will love. If your 14 year old boy is a Star Wars fan, he’ll be thrilled to receive the Holinox Star Wars Millennium Falcon Lamp, which features 7 different color modes and will turn his bedroom into an impressive, Star Wars-themed atmosphere. 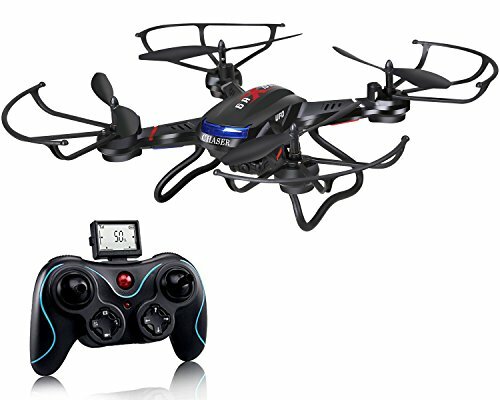 Every 14 year old boy wants a drone, but the Holy Stone RC Quadcopter features an HD camera for shooting quality images and videos so he can show off his adventures to friends and family. A key return and headless security system make this drone suitable for beginners as well as more experienced users. Every active 14 year old boy needs a water bottle that can keep beverages cold for hours while he plays his favorite sports, rides his bike, or goes about his typical active days. The Hydro Flask Double Wall Vacuum Insulated Stainless Steel Sports Water Bottle keeps cold beverages cold for up to 24 hours. This cool game is suitable for 5 to 10 players and is recommended for ages 13 and up. Because everyone plays until the end of the game, no one ends up feeling left out, making this the perfect game for a group of young teens. The premise of the game is the ability to lie to your friends and detect when they’re lying to you – teens will love to test out their fibbing skills on their friends. For the laser tag-loving teenage boy, this 2-player laser gaming set is a great choice, because it’s expandable (by combining it with other sets), meaning other friends can join in the fun when you purchase more than one. It’s compatible with all other Laser X sets, and players can participate as teams or individuals. Suitable for kids between 10 and 15 years old, the LEGO MINDSTORMS EV3 Robot Kit provides everything needed to build an interactive robot that you control via an infrared sensor system. An icon-based, drag-and-drop programming interface makes it easy for younger teens to program their very own robot. This is one of the pricier gift ideas on this list, but it promises hours of entertainment that’s also educational. A meter-high model of the NASA Apollo Saturn V (approximately 1:110 scale), this building kit is the perfect gift for the aspiring astronaut or budding engineer. If the teen boy on your list isn’t really into rockets, but does love Star Wars, the LEGO Star Wars VIII BB-8 is just the gift for him. With a wheel-activated rotating head, an opening hatch, and a display stand, this is one creation he’ll be proud to display. LEGO’s Technic lineup is ideal for teens who have outgrown ordinary LEGOs but still love building stuff. This particular set is a getaway racer, making it an ideal gift for the 14 year old boy who loves fast cars. Other cool options in the Technic line for racing enthusiasts include an off-road racer and a champion racer, among others. Every 14 year old boy wants to be the king of his own domain, which in this case means his bedroom. The littleBits Base Kit allows him to rule his room while also developing his engineering and problem-solving skills, making it a win-win for him and his parents. These days, kids aren’t just playing video games on their own console; they’re interacting with other players from around the world while they interact and strategize. That means your 14 year old gamer needs a headset, complete with a mic, to really get in on the action. The Logitech G231 Prodigy Gaming Headset is just that. A fun game of skill and luck, the Melissa & Doug Suspend Family Game is ideal for family game night but also provides enjoyable, wholesome entertainment for your teen and a few of his friends. Designed for one to four players, the Suspend Family Game combines hand-eye coordination, cognitive skills, and interpersonal skills for an all-around enjoyable activity. If you have an outdoors enthusiast on your holiday shopping list, or perhaps a budding bird watcher, these binoculars will surely be a hit. They’re durable and sturdy, with rubber construction and an IPX3 rating for water resistance. Lightweight and small in size, these binoculars are easy to carry, whether he’s taking them on a hike, to a sporting event, concert, or to the backyard for an afternoon of wildlife-watching. Because they’re so small, they make a great stocking stuffer, too. This Bluetooth headset connects to a PC, laptop, TV, or even a mobile device, providing crystal clear sound with passive noise isolation that dilutes external sound without damaging the sound quality of the audio he’s listening to. Nerf products have long been a hit among tweens and teens, and they just keep getting better. This Nerf Sports Aero Howler Football is the ideal gift for an active 14 year old boy, whether he loves football or simply likes cool stuff that travels an impressive distance. This football literally howls as it soars, and many teen boys will love it for this feature alone. The latest must-have item in the gaming world, the Nintendo Switch is topping every teen boy’s wish list this holiday season. At home, it rests in a dock that connects it to your TV, and when removed, it instantly transitions into a handheld gaming device for on-the-go fun. But that’s not all: you can also flip the stand in handheld mode to switch to multi-player, meaning two people can play both in your living room and on the go. This cool little light attaches to anything – bike handlebars, a shirt, a tent, belt, or just about anything you can think of – providing illumination anywhere you need it. For the teen boy who rides his bike often, and sometimes after dusk, this funky gadget is as useful as it is fun. One of the biggest trends of the 2016 holiday season, virtual reality continues to be all-the-rage, particularly among younger teens. So, if you’re really hoping to impress this holiday season, giving the teen on your list an Oculus Rift + Touch Virtual Reality System is guaranteed to please. It’s definitely not cheap, but Oculus is one of the most highly-regarded VR brands at the moment. You’ll also want to ensure that your gift recipient’s PC or laptop meets the minimum specifications required. The Outslayer Boxing MMA Heavy Bag is the perfect gift for the teen involved in martial arts or boxing – as well as the teen who just needs to let off some occasional steam. A heavy-duty, professional quality punching bag, it’s suitable for formal training or just letting loose to burn some excess energy. If you don’t have an appropriate location to install the hanging version, consider a freestanding option like the Century Weavemaster. If the Oculus Rift + Touch is out of your price range, these VR glasses cost less than $30 and have plenty of appealing features, such as broad compatibility with many Android, iOS, and Windows devices, adjustable pupil distance and focal distance, and more. This game takes about 60 minutes to play, and it’s suitable for 1 to 4 players, 14 and older. A strategic game of infection, evolution, and extinction, it’s based on a video game by the same name. So, if your 14 year old boy is a gaming enthusiast but you want to encourage some genuine, face-to-face interaction, this game is sure to be a hit. Go pro with the PlayStation 4 Pro edition, with 1TB of storage for all your games, spectacular graphics, enhanced game play, and much more. If the 14 year old boy on your holiday shopping list doesn’t live near the sand and surf, he can experience the joy of surfing with the Razor Ripsurf, which allows riders to curve and cut just like they could in the waves, but on dry land. If he’s more of a skateboarding kind of teen, consider the Razor RipStik Ripster. Recommended for ages 14 and up, the Reaper Miniatures Learn To Paint Bones Kit is a great gift for the artistic teen. The miniature figures come unpainted, and he’ll learn the techniques of basecoats, washing, and dry brushing as he puts his painting skills to work to make the figurines his very own. 39. Renegade Game Studios Clank! A fun, fast dungeon-delving experience, Renegade Game Studios Clank! receives rave reviews from users. Suitable for ages 12 and up, it takes 30 to 60 minutes to play with 2 to 4 players, making it a great game for a 14 year old boy and a small group of his friends. An affordable VR headset for gaming and video, Rok Am’s 3D VR Headset is extra-light with a natural fit for comfortable wear. At under $20, you can’t beat the price of this VR headset, especially given the praise it receives from owners. For the budding video game developer or programmer, Simply Coding’s Learn to Code products are a gift that will keep on giving for years to come. Suitable for ages 12 and up, Learn to Code PYTHON will guide him through the skills necessary to code multiplayer adventure games. If he’s interested in game design animation, check out this product from Simply Coding. Skullcandy’s Hesh 2 Bluetooth Wireless Headphones are perfect for the kid who loves gaming or likes to watch YouTube videos on his laptop or tablet. They come in a variety of colors and patterns, including a fun camo print, so his headphones can match his personality. 14 year old boys tend to have one thing in common: tons of energy! This trampoline is the perfect gift for the teen boy with lots of energy to burn. But that’s not all: it even has a basketball hoop, so it’s the perfect gift for a basketball lover, too. The outdoors-loving teen boy will be thrilled to receive this 50-foot Slackline Classic Set from Slackers, which comes with a bonus teaching line for beginners. It’s ideal for honing balance and improving core strength, and it’s super easy to use – setup takes less than 10 minutes. Enhance this package with the Slackline NinjaLine Intro Kit for a fantastic holiday he won’t soon forget. Star Wars fans and robot enthusiasts alike will love the Sphero Star Wars BB-8 App-Controlled Robot. It even comes with a Star Wars Force Band, which can also control the robot via push, pull, and drive gestures. A fun and active, 2-on-2, indoor or outdoor game, Spikeball was featured on Shark Tank and gets rave reviews from owners. With collapsible legs, it’s easy to store out of sight when not in use, and easy to set up when you’re ready for some fun. What’s more fun than a drone than a drone that you build yourself? Any 14 year old boy who enjoys building gadgets and putting things together will appreciate this gift. At less than $35, it’s incredibly affordable, too. If you know a 14 year old boy who rides his bike often, the Turbospoke Bicycle Exhaust System is sure to please. It makes an ordinary bike sound like a motorbike. The PS4’s main competitor, the Xbox One also comes in a 1TB console. This particular product is the Forza Horizon 3 Bundle, meaning it comes with the Forza Horizon 3 game in addition to the console. Can’t find what you are looking for? See additional gifts for teens.